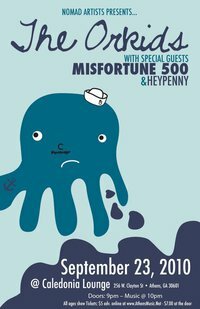 I’ve got TWO TICKETS to the Orkids, Misfortune500, and Heypenny show on Thursday that I want to give away. Preferably to you, of course! Naturally, I can’t just give them away. There’s a question you have to answer first! The Caledonia Lounge wasn’t always the Caledonia. It was known by another well-known venue name long ago. So what was it? Submit your answers to athensmusicjunkie@gmail.com with the subject heading “Octopus.” It’s first come, first serve so get to work! And if you make it out to the show, make sure to stop by and say hi. I’ll most likely be working merch. Again. How about a taste of the Orkids live? At the 40 Watt perhaps? Or click here for their awesome music video. And I just uploaded this video from the Hipster Party back in April of Misfortune500. Contest ends at 8 a.m. on Tuesday morning, winner will be announced on Wednesday’s post and notified via email that same day. Winner will have his/her name placed on the guest list for a Plus One ticket to the Orkids/Misfortune500/Heypenny show on Sept. 23rd.